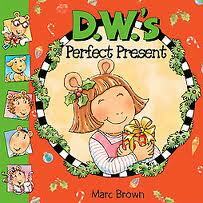 It's almost Christmas and D.W. can't wait to see her presents. She searches everywhere but the only presents she finds turn out to be for other people! When D.W. remembers that Christmas is a time for sharing, she starts searching for presents she can give rather than receive. With a little time and creativity, D.W. comes up with gifts for each member of her family-and finds that giving is the best present she can receive! Marc Brown is the creator of the bestselling Arthur Adventure book series and codeveloper of the #1 children's PBS television series, Arthur. He has also created a second book series, featuring D.W., Arthur's little sister, as well as numerous other books for children. Marc Brown lives with his family in Hingham, Massachusetts on Martha's Vineyard.